Born: Circa 1818, Kansas. Died: circa 1887, Oklahoma. Born around 1818 on the land of the Kansa people, a young warrior killed a Pawnee chief by the name of Allegawaho. The Pawnee word meant “Big Elk,” and was an appropriate name for the Kansas warrior who decided to adopt the name for himself. Allegawaho stood more than six feet in height. He was a member of the Small Hanga or Chicken-hawk people among the Kansa or Kaw. The Kaw lived at Blue Earth Village on the Kansas River from 1780 to 1828, near the present site of Manhattan. A description of the village in 1811 indicated there were 128 lodges. This rich valley offered opportunities for farming, hunting, and trading. For about half of the year the people lived in the village and tended corn fields. The remaining time was spent in western Kansas on buffalo hunts. They came in frequent conflict with their powerful enemies, the Pawnee. Three leaders, American Chief, Fool Chief, and Hard Chief, signed a treaty in 1825, relinquishing their 20 million acres, to a 2 million acre reservation in what is now western Shawnee County. After signing the treaty the Kansa moved east from Blue Earth Village to be near the Indian agency. They set up three villages just west of present day Topeka. Located in the Kansas River valley, they faced epidemics of smallpox and many of the people died. Floods in spring 1844 destroyed much of their crops and left the people destitute. The treaty of 1846 reduced the Kaw territory to 256,000 acres in the Neosho valley near Council Grove in 1847. There they established three villages in the area near the Santa Fe Trail. The Kaw villages became involved in a violent confrontation in June 1859 with the local white population, many of whom were settling on Kaw territory illegally. The treaty of 1859 reduced the reserve to 80,000 acres, with sub-divisions of 40-acre plots for each family. 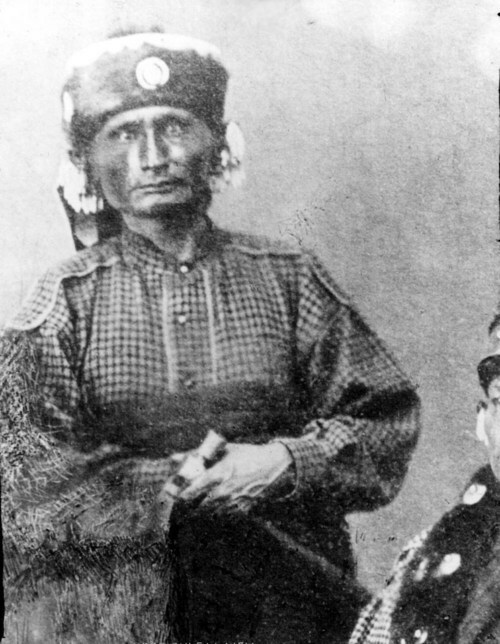 After the death of Hard Chief in 1861, Allegawaho became a co-chief of his village and one of the principal chiefs of the Kaw Nation. He was considered honest and truthful and capable of great oratory. In Allegawaho’s village, located near the present town of Dunlap along the Kahola Creek, there were 47 lodges occupied by 257 people. Eight people lived in his lodge, including his two wives, Wawgobah and Hoyah. Allegawaho was one of about 70 leaders of Indian nations who were summoned for a meeting in Washington, D.C., with Commissioner Bogy in January 1867. The Kaw Nation’s other two principal chiefs, Watianga and Fool Chief, were among the representatives. The government hoped that the council would lead to the removal of the native people from Kansas. In 1867 Kah-he-gah-wah-ti-an-gah (Fool Chief the Younger) killed a Kaw warrior without just cause. The tribe acted to remove Fool Chief the Younger as the principal chief and replaced him with Allegawaho, who was about 50 years old at the time. A federal act passed in May 1872 providing for the removal of the Kaw Nation. In June 1872 Interior Secretary Columbus Delano visited Council Grove to say that the Kaw would be deported to Oklahoma, Indian Territory. Chief Allegawaho spoke eloquently of his opposition to moving his people once again from their beloved homeland. He criticized the Union Pacific executives and demanded a fair price for his people’s lands. He pled for food, clothing, and schools for the children. Great father, you whites treat us Kaws like a flock of turkeys. You chase us to one stream, then you chase us to another stream. Soon you will chase us over the mountains and into the ocean, and we will have no place to live. Despite his plea, the 553 remaining Kaw people were moved to a 100,137 acre reservation in present Kay County, Oklahoma. The lands had initially been designated for the Osage people. Allegawaho continued to serve as a principal chief until 1873. He died about 1887 in Indian Territory. Today the Kaw Nation of Oklahoma has around 3,376 members.